Knowing how and when to tip is an important part of community education. I taught this last year using the resources below. I like to create resources that can be used over and over again as opposed to one worksheet that it used and then done with. Plus, this way you can easily modify your instruction to what your students need. Tip Charts: Don't you hate those tiny teeny tip charts with random amounts?! Problem solved! I created tip charts by figuring out 15% and rounding. The front has prices $1-$20, and the back $21-$60. The card is small enough to fit in a wallet but still big enough to read. To get students interested, we started playing “games” when I would write down a price and students would have to find the tip and shout it out. 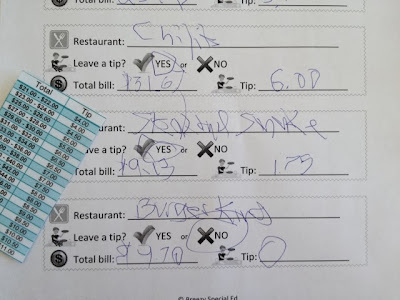 Restaurant worksheet: For this next worksheet I would write on the name of a restaurant and the total bill (making these up off the top of my head). 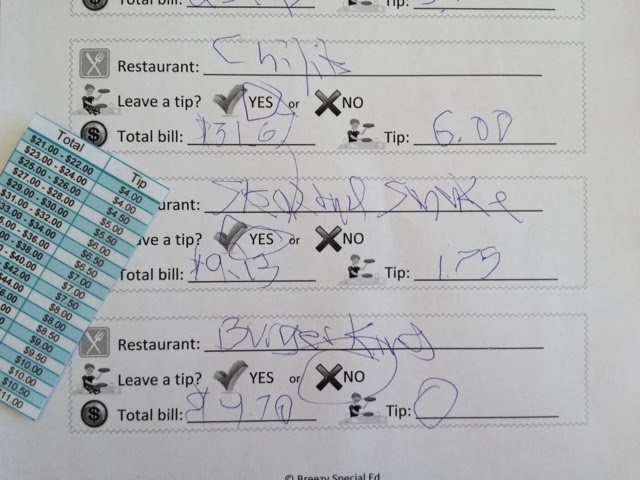 Students then used the worksheet to write the restaurant, circle yes or no to leave a tip, and then fill out the total and write in the tip (or $0 if no tip!) We talked a lot of about what restaurant you tip at and which ones you don't. This can be used over and over as the worksheet is not specific – it all has to do with what you write on the board. This way you can also make the restaurant names relevant to students and give prices as are appropriate for the levels of your learners. 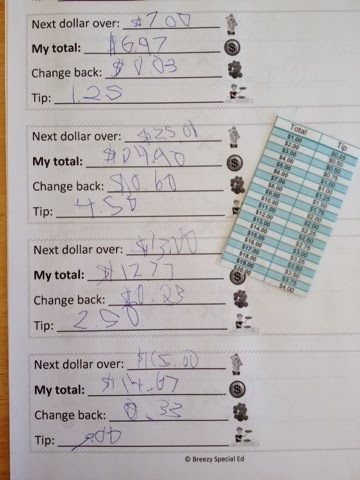 Tipping and Dollar Over/Change Back worksheet: This is similar to the last worksheet, with a few more steps added in, included dollar over and change back. I put the total in bold print to remind students to fill that in first since that is what is given to them, then they can figure out the dollar over amount to pay with and calculate change back by subtracting the two numbers. Finally, students figure out the tip. Like the last worksheet, you write the totals on the board and this can be used over and over again! 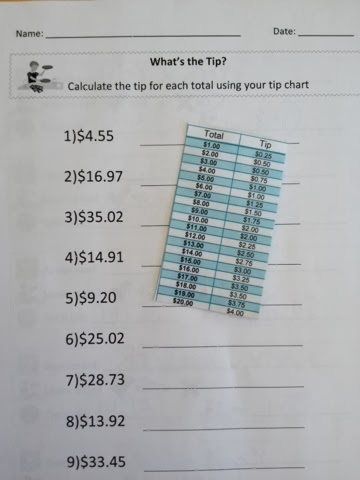 What’s the Tip worksheet: Great for starting out – all that is needed is to figure out the tip for the amount given using the tip chart. In my tip packet, this worksheet has fill-able spaces for you to fill in your own numbers based on where your students are at and so you can use it over and over again. Wonderful post. Keep sharing such a informative post. (C) Brie Holtrop- Breezy Special Ed. Powered by Blogger. Hi! I'm Brie, the teacher-author here at Breezy Special Ed and I am passionate about helping all students succeed. I create resources to help teachers help their students unleash their fullest potential! Thanks for joining me! Purchase Pre-Made Resources on Etsy! January Currently and Happy 2014 Resolutions! © 2015 Breezy Special Ed. Justine Template designed by Georgia Lou Studios All rights reserved.